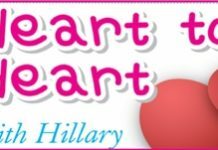 Home Blogs Heart to Heart with Hillary Missing alias? I have been seeing a girl from the local and she gave me her phone number. Good, I thought, we’re going to the next step in this relationship. Last weekend I had nothing to do, so I sent her an SMS and she replied, “What name you?” I thought she must be joking and wrote back “George!” The reply floored me “What George?” Do you think I have been reading too much into the relationship? You’ve got me confused here, just how do you think she can handle all this? You send an SMS with no name, then you send another calling yourself “George” and then you write to me, calling yourself “Robbie”. Just who are you? Robbie Burns perhaps pretending to be George Burns? Or the other way round? But I think both of them are dead. Face facts George/Robbie, she meets people with no names every day. On that day you were probably the third “George”, and she is just trying to work out, which one of you has the most money.